bl.uk > Online Gallery Home	> Online exhibitions	> Asia, Pacific and Africa Collections	> Bhore Ghauts. A photograph of a view of the Bhore Ghauts near Bombay from the 'Vibart Collection of Views in South India' taken by by an unknown photographer about 1855. 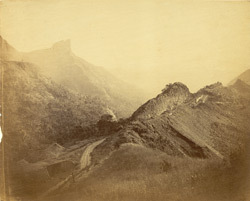 The reversing station on the Bhore Ghat Incline under construction, with the hill known as the Duke's Nose in the distance. The idea of a railway to connect Bombay with Thane, Kalyan and with the Thal and Bhore Ghat inclines first occurred to Mr. George Clark, the Chief Engineer of the Bombay Government, during a visit to Bhandup in 1843. But it was not until 1856 that Bhore Ghat, 15.75 miles in length was begun under the direction of engineer William Frederick Faviell. The work was continued by Solomon Tredwell after Faviell's death in 1859. About 42,000 workers (peak of 1861) including many tribals, 32 different classes of artisans & labourers (10,822 drillers/miners, 2659 masons, buttiwalas to load & fire blasts, storekeepers, timekeepers, interpreters, filemen, platelayers, trumpeters for mustering people, thatchers, harness makers etc worked here. Coolies travelled on an average of 15-20 miles a day and carried an estimated 6,296,061 cubic yards of earthwork on heads.